If you step into any sports training facility, you might see some exhausted athletes lying in a tub of ice after a workout. The ice bath has been around for years, but lately it has become a hot trend in recovery techniques. Some facilities specialize in cryotherapy, which is the use of hyper-cool temperatures to speed up the healing process in soft tissue and joints. 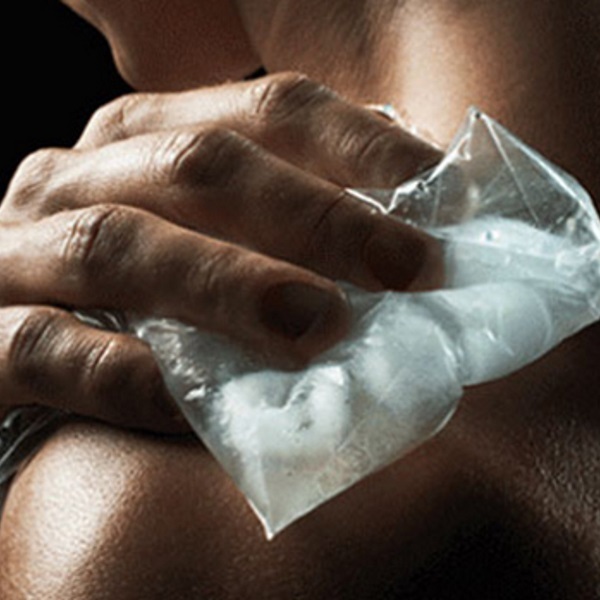 These techniques are especially popular among athletes, and it seems that icing after workouts has become a standard method of recovery. But what if I told you that using ice after a workout is the exact opposite of what you should do to speed your recovery? What if I told you that icing after a workout actually slows down and directly interferes with your body’s natural healing process? I really don’t like to speak in absolutes, like “You should never ice after a workout again!” But in my opinion you should be doing other things instead. Back in 1978, in The Sports Medicine Book, Dr. Gabe Mirkin coined the term RICE (Rest, Ice, Compression, Elevation). Since then, icing has been the standard treatment for injuries and sore muscles due to its ability to relieve pain immediately in a cost-effective manner. I distinctly remember my 5th grade AAU basketball coach telling us about RICE techniques, and from that point forward, I iced every ache, pain and bruise. We learned it in middle school and high school health classes. Even my college courses supported RICE. Icing is literally the go-to default treatment for any inflammation. It wasn’t until a few months ago when I read a newsletter from Dr. Mirkin, the creator of RICE, and noticed a paradigm shift happening right before my eyes. Mirkin published an article that directly debunked his own theory and exposed the lack of benefits that come from icing injured tissue. “Coaches have used my RICE guideline for decades, but now it appears that both ice and complete rest may delay healing, instead of helping,” Dr. Mirkin wrote. The article, “Why Ice Delays Recovery,” opened my eyes to a legitimate question. Have we been doing recovery wrong all these years? Should we stop using ice after a workout? You’re probably sitting there in disbelief like I was. At first, the idea that icing is bad for you blew my mind. But if we think in terms of basic health common sense, the idea isn’t outlandish at all. In fact, after I outline my thought process below, you may wonder how you ever thought icing an injury was a good idea. We know without a doubt that inflammation is necessary in the healing process. Without inflammation, the body doesn’t know where repair is needed. The body has a natural mechanical response to inflammation, which is initiated by the circulatory and lymphatic systems. In this context, the circulatory system’s job is to send cells to the inflamed area for healing. Whether it’s germs, allergens or damaged muscles, the body reacts this way every time, because it wants to get back to 100 percent functionality. The lymphatic system is similar to the circulatory system, but it doesn’t have a heart to constantly pump blood through it. Instead, it is activated by skeletal muscle contractions and breathing. The lymphatic system is the drainage system of the body. It delivers lymph, which contains the healing cells mentioned above, into the bloodstream so they can do their job. With that as background, ask yourself what is the number 1 reason people ice an injury or ice post-workout? Answer: to reduce swelling (i.e., inflammation). But by reducing inflammation, you’re counteracting your body’s natural response to injury or trauma. You may numb or mask the pain, but in doing so, you are confusing your body so that it has no idea what area needs repair. Ice has also been proven to decrease blood flow to the area of application, shrinking vessels near the injured area. Less blood flow to the area translates to fewer healing cells making their way to the injury. Again, counterproductive. Lastly, the R in RICE now seems sketchy too. We know that the lymphatic system jump-starts the repair process, and that it is activated through muscle contractions. Complete rest is unwise in this situation because limiting muscle contractions would limit lymphatic activity. So when we break it down it’s simple: If ice reduces inflammation, and if inflammation is a key to repairing injury or damage, then icing slows down recovery. If you’re into scientific data, you can read studies that support this theory here, here and here. Not sure what to do instead of icing? Keep reading. I’m officially coining the term MACHO (Mobilize, Activate, Compress, Hydrate, Observe). This is my new standard for healing all plausible injuries. Instead of icing after a workout, give this a try. Mobilization, when possible, is crucial to the recovery process. If you have a compound fracture in your leg, you obviously won’t be able to do anything on your own. Go see a doctor. We’re talking sprains, strains, pulls, bumps and bruises here, people. Try to keep the region as mobile as possible by taking the nearest joint(s) through its full range of motion to the best of your ability. Mobilization and activation go hand in hand. In this case, when mobility is too painful or simply impossible, activation is a great next step. Activation can be manual, with techniques like MAT, SMR or ART, where the muscle is precisely triggered by hand/object to promote activation. If that is too painful, try another activation technique like the TENS Unit, which stimulates surrounding muscles without causing direct pain. The only remaining letter of Dr. Mirkin’s RICE is the C. The C, for compression, is here to stay. Ideally, you want to compress the area and mobilize it while it is compressed. You can lightly compress the area for extended periods of time with clothing or bandages, but only tightly compress the area for 2-4 minutes at a time about every 2 hours. Water is essential for nearly every function of the human body, which is composed of about 60 percent water. Dehydration can increase joint pain, muscle soreness and slow down the lymphatic process. Staying hydrated will ensure that everything is functioning properly. When you’re injured, I recommend adding 24 ounces to whatever total you usually aim for. Observation is the last (but not least) step to the MACHO system. Your body gives you continual feedback during the recovery process. It’s your job to observe and react to it. How does the affected area feel? Has the issue become worse? Are you feeling the repair process take place? How does the affected area look? Is your inflammation decreasing on its own? Value the feedback from your body and use it to your advantage by taking measures toward rehabilitation of the injury and plans for future injury prevention. My recommendation is to ditch the RICE technique and move to my MACHO technique. Better logic. MACHO makes sense when you think about the processes of the body. Better results. MACHO has impacted my clients’ (and my own) training with positive results. All due respect to Dr. Mirkin. I only hope to have half of the success, knowledge and impact he’s had in the sports industry. But when the man who invented RICE tells you to move away from it, it’s time to move away from it. Anti-inflammatory methods can mask pain or soreness temporarily, but that doesn’t equate to full functionality. Follow the MACHO steps to recovery for fully healed injury with long-lasting benefits.